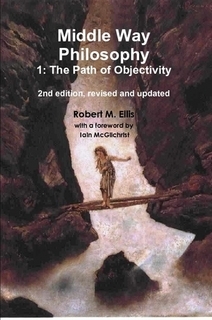 Initially inspired by the Buddha’s Middle Way, but working in Western Philosophy and related disciplines, Robert M. Ellis first developed Middle Way Philosophy in a Ph.D. thesis in 2001. This new detailed account is the product of a further ten years of refinement of his approach, and concentrates on the philosophical core. It is followed by three further volumes focusing more on the psychological and practical implications of the philosophy. Middle Way Philosophy makes us re-examine entrenched assumptions, and aims to clear the ground for practical progress by avoiding dogmas, both positive and negative. It focuses on adequacy of judgement as the basis of objectivity in both science and ethics. Iain McGilchrist, author of ‘The Master and his Emissary’.